The recent media frenzy over the “balloon boy” hoax has gotten me thinking about the use of the media in today’s society and how it impacts our youth. The explosion of mass media over the past 10 – 15 years, from 24-hour news networks to the internet and email to blackberries and cell phones for everyone, has undoubtedly had a positive impact in many ways. Vital information can be widely disseminated at the click of a button. Parents can keep close tabs on their children. Businesspeople can check their email and voicemail during the metro ride home. Practically anyone can contact anyone else in the world, anytime, from virtually anywhere, using at least two different forms of instant communication. So much has changed since the bygone days of my own adolescence (we’re talking mid-1990’s) that I am beginning to feel like a grandparent on a rocking chair, pontificating about how, back in my day, we had to walk 10 miles to school in the snow uphill both ways. And then there’s the ugly side. We spend precious time surfing the internet, watching YouTube videos and facebooking and twittering and texting. This is time that could have been spent reading or playing outside or exercising or engaging in a hobby or spending quality time with family and friends. Going a day, or even a few hours, without internet access leaves some people paralyzed. We feel naked without our cell phones; out of touch without instant access to emails. The amount of time we spend chained to various electronic devices continues to increase exponentially to the point where many people can no longer really relax or get away from their work or their social obligations. My greatest concern about the mass media explosion is the impact it has on youth – their perceptions of reality, their aspirations for fame or recognition, their interpersonal boundaries, their privacy, their sense of what is normal and reasonable and right. I find it disconcerting when a young patient decorates her myspace with pictures of the scars on her wrists or photos of herself at a dangerously low weight. I am frightened when a teenage girl shares intimate details of her abuse history and her multiple psychiatric hospitalizations with her “friends” on facebook. “Everyone does it,” they say. “It’s not a big deal. It’s who I am.” It IS a big deal, I argue. And no, it’s NOT who you are. Therein lies the rub. A person who presents herself online in this fashion is engaging in a disturbing form of emotional exhibitionism that has proliferated alongside recent technological advances. She is promoting dangerous stereotypes, over-identifying with her illness, and encouraging others to do the same. I do my best to chip away at the silence and stigma surrounding mental illness, and I firmly believe that having depression or bulimia or borderline personality disorder is not something to be ashamed of. But it’s also not something to advertise to a world-wide audience of anonymous viewers with questionable motives. These are issues to be discussed with a therapist, with family members, with a select group of long-time, trusted friends. I am ambivalent about the proliferation of websites and blogs about personal experiences with mental illnesses. On one hand, as a therapist, I fully appreciate the healing power of writing, sharing, and connecting. 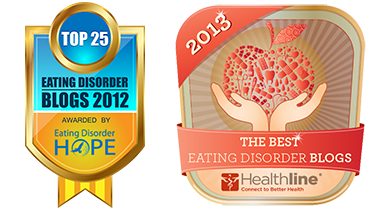 Individuals who share their personal stories of psychological disorders with a worldwide audience are providing hope, support, and inspiration to others who are in similar positions, while slowly chipping away at the shame, secrecy, and stigma that continues to surround mental illness. 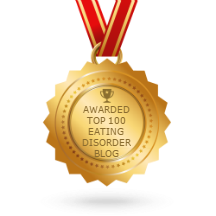 I frequent several blogs (Carrie Arnold’s ED Bites, Laura Collins’ Eating With Your Anorexic, and Harriet Brown’s Feed Me) authored by individuals who have personally struggled with eating disorders or helped loved ones recover. 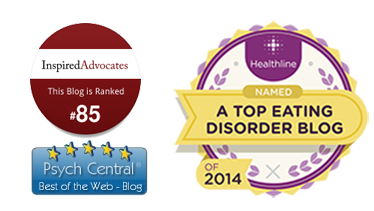 I admire these authors’ commitment to advocating for improved awareness, understanding, information, and evidence-based treatment for eating disorders. The authors’ personal experiences are interwoven with scientific research in ways that educate, enlighten, and inspire. On the other hand, I have also read numerous websites and blogs, authored by individuals with mental illnesses, which I can only characterize as glaring emotional exhibitionism. These blogs are not-so-subtle cries for help, yearnings for deeper connection through a superficial medium. I am not quite sure who is benefitting from a young woman’s blog posts detailing her various creative methods of purging or her meager consumption of carrot sticks for days on end. How about writing in a good old fashioned journal? Seeing a therapist? Joining a support group? Calling a friend? Meanwhile, how about developing a healthy identity apart from your symptoms and making real-life friends outside your diagnostic category? The individuals who use the internet in this way are not the source of the problem. They are the victims of a society that fails to teach appropriate interpersonal boundaries and encourages people to sacrifice their self-respect for a chance at instant notoriety. What happens ten years down the road, when the teenage “cutter” with a provocative personal website applies for a job as a high school teacher? How will this deeply personal, globally publicized information impact the course of her life? Only time will tell. For now, I’ll step away from my computer, get back on my rocking chair, and try to remember what life was like before blogging.